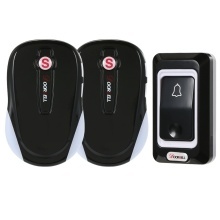 *Wireless Ding Dong Doorbell,perfectly fit for apartment,villas,home,hospital and many other needed places. *Full-digital frequency modulation technology,never code stringing. *Ultra-low power consumption design,power saving and lasting.ABS material for stable performance and long time use. *28 chord ringtones to choose from and 3-step volume adjustable. *Long distance control,strong penetration and stable signal.Simple & easy to operate,simple appearance elegant design.